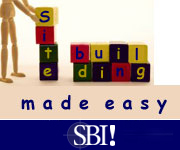 Site Build It is the easiest, yet most sophisticated, business website builder available today. It comes with all the tools and add-ons you will ever need including a college level education for creating a successful online business. You can build a business website around any passion, hobby, or expertise that you possess, and it is fill in the blank easy. The SBI Action Guide provides step by step guidance with your choice of either videos or text instruction. Best of all, you can try Sight Build It for 90 days free, and if you are not satisfied you can get your money back. You do not need any programming skills, any website building skills, any business skills, or any products to sell. All you need is the desire to succeed. There are many ways to make money with an e-commerce website. Perhaps the easiest is with advertising. If you surf the web, you are familiar with the blocks of "Ads by Google." Everytime a visitor clicks on one of these ads, the website owner makes money. Another way is with affiliate marketing. I am an affiliate marketer for CreateSpace. When a visitor clicks on a CreateSpace link and follows through by becoming a member of CreateSpace, I earn a small referral commission. Selling e-books, articles, or e-courses is a popular way of making money. You can also sell your own products. For years, I sold autographed copies of my books. Be aware that labeling, packaging, and shipping is real work. The bottom line: You can make money with a Solo Build It business website. COMING SOON: Solo Build It 3.0! Leave Site Build It and return to the Home Page.